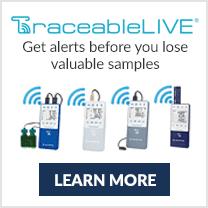 Problems associated with typical low-cost, low performance pocket pH meters. Stanley Goldman, a doctoral candidate at a major midwestern university, uses a popular pocket pH meter (so-called because users tend to keep them in their pockets) to verify the pH of his tris buffer prior to running DNA electrophoresis samples. He frequently finds that he has to buy replacement electrodes for his meter due to obvious incorrect pH readings or sometimes no reading at all. 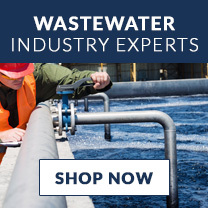 Chris Schueler, a manager at a municipal wastewater treatment plant, purchases another brand of pH meter for his technicians to spot check wastewater before, during, and after processing. His team often complains that, after a week or so of use, the meters displays of pH are more sluggish and erratic compared to when the meters were new. Sluggish pH readings, that take 15 to 30 seconds to register changes, erratic measurements that fail to stabilize, blatantly incorrect values, or no pH display at all, are common complaints for users of pocket pH meters. 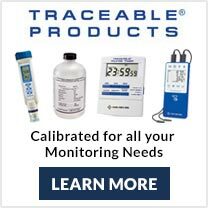 The problem is common to pH meters, no matter the type, and can usually be traced back to the electrode itself. In the cases above, the type of electrode designed for use with the pocket pH meters (also known as testers) further aggravates the problem. Simple, single-junction electrodes keep the overall price of the meters down, but are much more prone to problems and shorter lives than their double-junction counterparts. 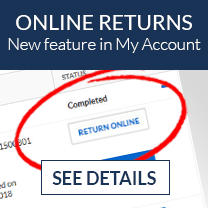 Lets take a quick look into why. 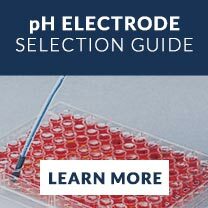 Why do pH electrodes fail? The reference electrodes ions (suspended in liquid, gel or a polymer) are very slowly depleted with use. 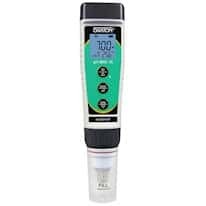 Electrolyte depletion occurs with all pH electrodes whether they are heavy-duty, industrial electrodes, a sophisticated laboratory electrode, or an electrode on a pocket pH tester. If this were the only factor deteriorating a pH reference electrode, electrode life would be long enough to meet both Stanleys and Chriss expectations. Contaminating ions from the sample can rapidly cause chemical reactions with the silver/silver chloride reference electrolyte solution commonly used in pH reference electrodes. This causes sluggish, erratic, wrong or even no pH electrode responses as the reference electrode wire is spoiled, or the reference junction is clogged. This results in fast electrode failure. This type of deterioration proceeds most rapidly when the pH reference electrode is a single junction pH reference electrode and the solution measured has high concentrations of ions that contaminate and then attack critical components of the reference electrodes. Some of the most common industrial and laboratory applications that experience rapid failure of pH electrodes include, spot checking of tris buffers, testing plant nutrient solutions, measuring solutions with sulfides and/or metal ions, determining pH in food and wine, chemical processing, as well as wastewater analysis. 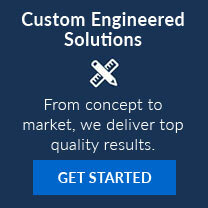 How do double-junction electrodes work in harsh applications? A pH electrodes junction is the porous communication point between the electrolyte solution in the reference electrode and the sample itself. 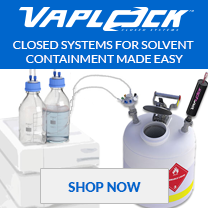 Basically this solution must leak out into the sample in order for the electrode to achieve accurate results. In a so-called single-junction electrode, the junction is in direct contact with the sample, allowing contaminants to pass directly into the electrolyte solution. The contaminants can then attack the reference electrode wire, sometimes quickly destroying the pH electrode itself. In a double-junction electrode, ions that attack the pH reference electrode signal wire or react with the internal pH reference electrolyte (Ag/AgCl), take much longer to come into contact with the pH reference signal wire and internal pH reference wire. These contaminants must migrate through the first (outer) reference junction, build up a concentration in the cell filled with KCl reference electrolyte, and finally migrate through the second (internal) reference junction before coming into contact with the pH reference electrode signal wire and internal pH reference electrolyte. This longer migration of contamination to internal reference cells delays the pH reference electrode damage that ruins the pH electrode. This makes the double-junction pH reference electrode, and the entire pH electrode system, last much longer than single-junction pH electrode systems. Testers are now available with double junction electrodes. For the longest time, technology did not support the manufacture of both inexpensive pocket meters and their replaceable electrodes (usually known as sensors). The emphasis was to put the investment in the meter and to keep overall costs down by skimping on the sensor. Hence only single-junction electrodes were made available to tester users. The lack of longer lasting sensors also helped to bolster replacement sensor sales. And as a result, poor consumers like Stanley and Chris had no choice but to regularly order replacement sensors or completely new testers. However, as the popularity of testers grew, manufacturing advances drove the cost of the meter down to the point where better sensors could be developed. In addition, the market, represented by users like Stanley and Chris, became more and more vocal about the shortcomings of a single-junction pH reference electrode system. They demanded a pocket pH meter with a longer-lasting pH sensor. 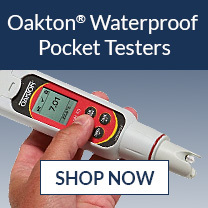 Oakton Instruments® responded with the recent introduction of a double-junction reference pH electrode within the sensors of their pocket pH testers. Stanley and Chris now have an option that will provide them with an inexpensive and convenient way to measure pH with the longer life expectancy that they require. 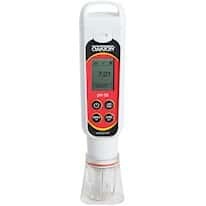 Oaktons pHTestr® 10, 20, and 30 offer many great features at a price of less than $100.00. 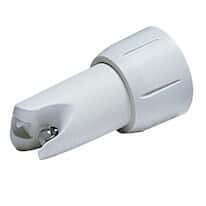 The replacement sensor is only $55.00 and can be changed in less than a minute without any tools. Because it equipped with a double-junction pH reference electrode, Stanley can feel confident that he will get reliable readings, time and time again, in tris buffer. And Chris can keep his budget under control while his staff takes pH readings at the plant. As the tester market continued to demand evolution, manufacturers such as Oakton Instruments® have added features such as waterproof and dustproof housings to protect them from rugged wet environment and mishandling. In addition, large, ergonomic displays make reading much easier. 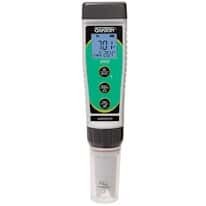 Automatic temperature compensation, a feature usually reserved for much more expensive hand held and bench top meters, was also added to the latest models. Some models are even capable of measuring and displaying actual temperature. But without the incorporation of the double junction pH reference electrode, none of these changes would mean much since a quick, reliable and cost effective pH measurement would not be readily available in the first place.